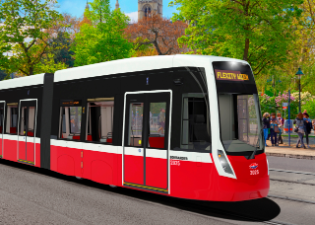 BERLIN, 2015-6-9 — /Travel PR News/ — Rail technology leader Bombardier Transportation and the Vienna transport authority, Wiener Linien, have signed a contract for the manufacture of 119 FLEXITY Vienna trams, which includes a 24-year FlexCare maintenance management system agreement. The contract is valued at approximately 431 million euro ($480 million US) and includes an option for an additional 37 trams and further maintenance support. The vehicles will be manufactured at Bombardier’s Vienna site. The 34-meter long FLEXITY Vienna trams accommodate 211 passengers, feature wide passage ways, spacious multipurpose areas and low entrances, setting new standards for passenger comfort. The combination of internationally proven low-floor technologies and BOMBARDIER FLEXX Urban bogies also guarantees a smooth ride. Furthermore, due to the use of well-proven BOMBARDIER MITRAC propulsion equipment, the FLEXITY trams also distinguish themselves with an availability rating of over 95 percent. The trams will be supported by FlexCare, Bombardier’s innovative maintenance management system. Easily integrated into existing maintenance processes, FlexCare enables customers to perform maintenance at their own depots under the overall maintenance management responsibility of Bombardier. This system guarantees high availability and reliability for the vehicles and offers customers planning reliability and cost certainty over the contract period. More than 1,300 FLEXITY 100% low-floor trams have been sold to date. Overall, Bombardier now has more than 4,000 trams and light rail vehicles in successful revenue service or on order in cities across Europe, Asia, Australia and North America. BOMBARDIER, ECO 4, MITRAC, FLEX, FLEXITY, FLexCare and The Evolution of Mobility are trademarks of Bombardier Inc. or its subsidiaries. This entry was posted in Business, Trains, Transportation, Travel, Travel Management, Travel Services, Travel Tech, Travelers and tagged Bombardier Transportation, Carsten Bopp, FLEXITY, Vienna trams, Vienna transport authority, Wiener Linien. Bookmark the permalink.